My 2000 Civic EX, 2 door engine is vibrating and causing the whole car and steering wheel to vibrate. It vibrates at all RPMs, you can really feel it at low RPM. When accelerating from the stop, between 700rpm and 1000rpm you can feel it the most. It also sounds like there is a hole somewhere in the exhaust, but after the inspection the exhaust is fine. I replaced the engine mounts and spark plugs and cables but the vibration still continues. Not sure what to do next? Car has 120,000 miles. What was done prior to the vibration issue? Or, no updates/changes made and the vibration slowly or suddenly came on out of nowhere? I need to get a Factory Service Manual for my wife's '93 Civic Ex. It could be that you like me, when we put our new motor mounts in, we tightened some of the mount bolts up too much or in the wrong sequence. 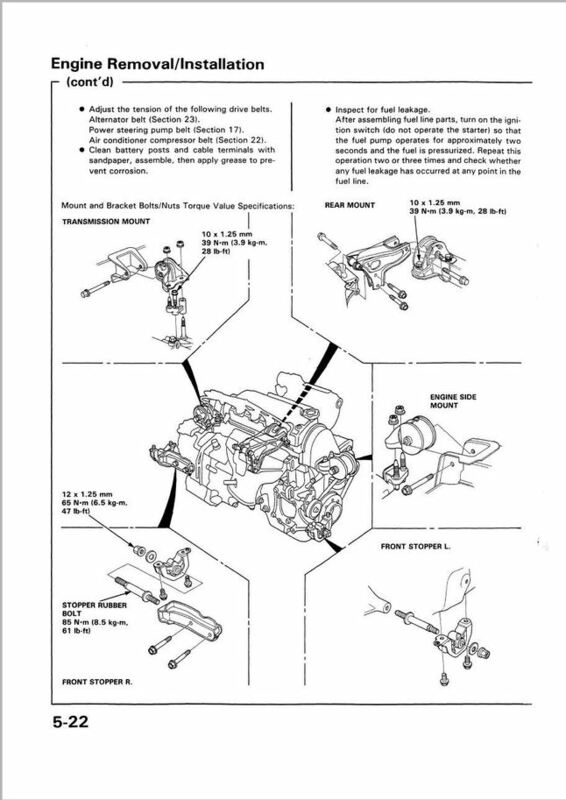 I found something about that last night researching and somehow ran into an Autozone repair guide for engine removal that had that information for my wife's Civic. I've been researching hit and miss for yours (and my wife's too) but can't back into it today. This may be causing your/our engine vibration issues (more than normal). I believe this to be true about bolt sequence installation and torque or snug tighten values as I had a '91 Dodge Caravan that had to have a specific torque sequence on the AC Compressor bracket bolts or it would be noisy as hell. Maybe somewhere/someone here at this forum has that information for your 2000 and my '93 Civic EX. Gotta go for now to work on my truck. I tightened the bolts in order according the Honda specs, but i did not use torque wrench. So i am thinking this is the problem. Also, i had a timing belt and water pump replaced by my dad's buddy in September. The timing belt is too tight, because it is making some noises, but i was told by the guy that it will be ok. (What else he is going to say, right) But it sounds like a coffee grinder. You are essentially hijacking the OP's thread this way. Just so you know, there is not a specific order for motor mounts on the 5th gen. And finding torque specs on some of the mount bolts is virtually impossible as it's not published in the FSM on the 5th gen. The problems usually come when certain mounts are replaced with mounts other than OEM. Or worn out mounts not being replaced at all. You have avoided my questions which is critical in diagnosing the issue. Was anything done prior to the vibrations or did the vibrations come on and you have been replacing stuff since? The vibrations started after exhaust pipe was fixed. It was the pipe that is right before the cat converter. The one with the flex bolts/springs. I had this redone, because i thought that was the cause of the vibration. But the vibrations continued, so i googled possibilities of other things going wrong and found out about engine mounts. Out of the 5 engine mounts, lower driver side mount was bad. The other mounts were ok.
Before the engine mounts were replace, the vibrations were mostly felt at low rpms and the steering wheel did not vibrate. After replacing the mounts, i feel the vibrations at all rpms and the steering wheel is vibrating too. I disagree as he mentioned he had a vibration issue and one of his corrective actions was to change his motor mounts. So these were suspected as a possible cause from the very beginning. Scroll down and Refer to 92-95 (5th Generation) figures 20 thru 30. "Failure to tighten the bolts in the proper sequence can cause excessive noise and vibration, as well as reduce bushing life. Be sure to check that the bushings are not twisted or offset." Personally, I only assumed AutoZone got this information from a Honda Factory Service manual somewhere but who knows where they pulled it out of. Also, I get confused of the OP's 2000 Civic as Generation 5 because the Civic forum here goes from 92-2000 - his Civic is shown as Gen 6 in Wikipedia. be a common generation of Civics. Thank you for the answers guys. I will look at the AutoZone repair guide. I tightened the screws in sequence according to the Honda manual i found online, however, i did not use the torque wrench. You mentioned wanting to get the FSM, I have the FSM for both 5th gen (92-95) and the 6th gen (96-00). They are similar but not the same. 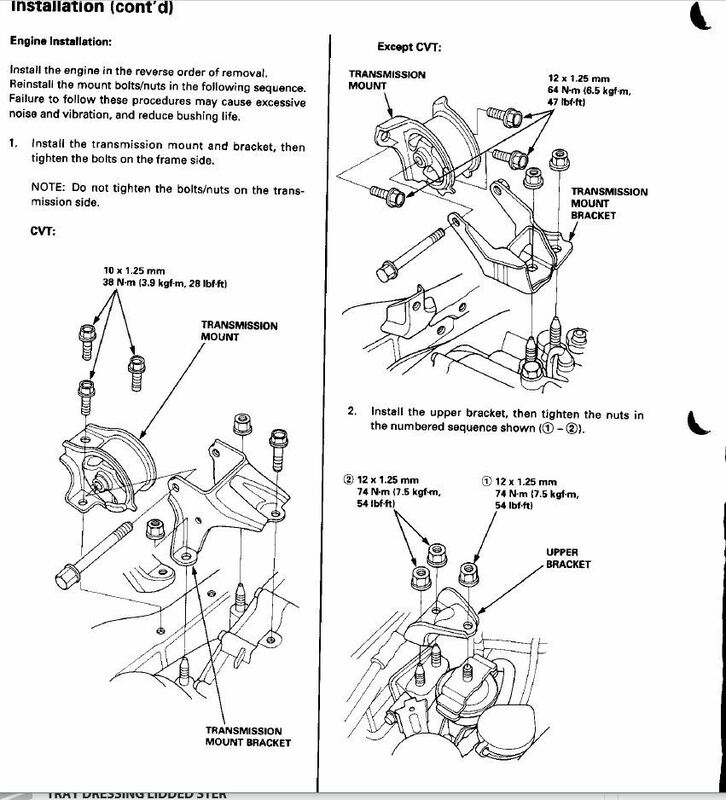 Autozone has repair information from all kinds of sources but in this case, it does not appear to be the 92-95 Helmsinc.com manual (Honda Factory Service Manual). If there was a specific sequence to do the mounts on the 92-95 then all my engine swaps on my 95 and 93 would have have issues. None of them did. However, when I put 2 solid bushing torque mounts on, I felt severe vibration as described. Honda does state there is a specific torque pattern for the 5gen and not following could (not will) cause vibration, now whether or not it makes a difference is another story. 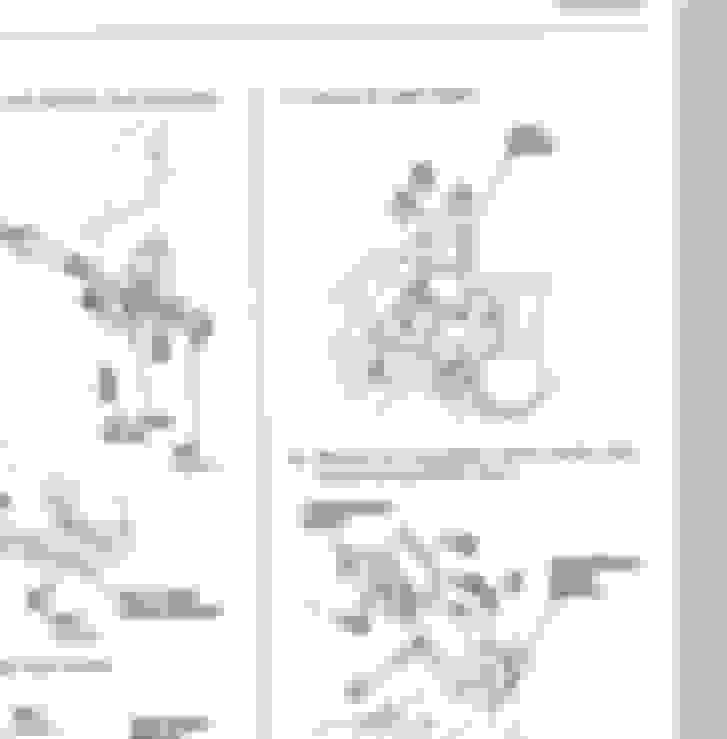 It really does not specify specific torque sequences when looking at engine installation. It doesn't make a difference if you torque the torque mounts before doing the rear mount. The only two mounts that are always done first typically are the two side mounts as they will hold the engine in place. If there was a specific order, they would number each one to do. Also, please notice torque values are missing for many of the bolts. I have studied the 92-95 FSM manual extensively. They typically do indicate an order of disassembly and say reverse the order for assembly but as for the mounts, it's not critical. When a sequence is critical to Honda, they provide sequencing numbers like the head bolts, the oil pan nuts/bolts etc. Even the girdles have specific sequences which are critical. I still stand that torque sequence has little to nothing to do with errant vibration. However, the type of mount will play a MASSIVE role. It's common consensus that the only mount on the 5th gen that can be changed to a solid mount type on a daily driver street car is the rear mount as it gives the best performance boost with the least amount of unwanted vibration. The 6th gen manual provided a touch more torque specifications than the 5th gen as was noted in another thread. That is odd your FSM doesn’t specify a tightening sequence bc my 92 FSM does. I’ll find the page when I get home. I finally got a chance to peak through the 6th gen FSM and it is indeed much more detailed and has sequences indicated for the mounts unlike the 5th gen. It even provides torque values for many of the bolts not indicated in the 5th gen.
Of note, the damper on the transmission pictured below looks like the fluid filled type mounts, these are notorious of going bad and would cause excessive vibration. As well, replacing it with non OEM it could be a non fluid version which would also cause excessive vibration. I suspect this mount to be the culprit of your situation. Step 41 mount (step 2 on second page posted). As long as all bolts and nuts are tight and all mounts flushed with their contact points, it wouldn't be the cause of vibration. The improper torque on the fasteners (bolts/nuts) will either loosen over time or fatigue the fastener to cause premature failure at some point. If the 6th gen is anything like the 5th gen, you will have two side mounts (1 engine, 1 transmission), one rear mount and you will have two side torque mounts. Are any of these mounts replaced with non oem or already non oem mounts? Many third party mounts will use harder rubber dampening or poly dampening. Both of which will transfer a lot more vibration into the cab of the vehicle. Another piece to seek clarity, do you have this vibration when not moving or only when the vehicle is moving? Last edited by TomCat39; 03-01-2019 at 10:56 AM. So i had some time to work on the car and i cleaned the throttle body and replaced the MAP sensor. After i replaced the MAP sensor it helped a little bit. It shifts better, however the vibration is still there. Not as much as before, but still there. The vibration happen at idle and while driving. I don't think the vibration is caused by the engine mounts, because before i replaced them and after the replacement its all the same. No check engine or codes at all. Would the over tightened timing belt cause this? Its impossible to overtighten the timing belt when it has a tensioner. New mounts will cause some vibration until they are worn in. Current car is a y8 that shakes like paint mixer, but idles smooth as butter. Its because all the motor mounts are shot on the y8 that I feel no vibration. Something else might be going on with mine, besides the motor mounts. My Civic might have a problem related to the air. Intake air or the exhaust. At the top gear, when i accelerate i can hear lower pitch sound coming out from somewhere (Sounds kind off like there is an exhaust leak). However, i could not pinpoint anything at all. Not entirely true. You can easily pull on the tensioner and then tighten the bolt, in fact I have done this when I was young and inexperienced. It didn't cause any issues, but it can definitely be over-tightened. you right, only the cheap and inexperienced would do that. You can't always eyeball an engine mount that's 25 years old and say it's bad or "ok". Sounds like you have an auto? If so, they are notorious for vibrations at idle. Usually the rear mount replacement fixes this or at least helps with vibrations. Unfortunately, all of the mounts probably need to be replaced to have a super smooth idle and again, that's if your engine/transmission/converter are in exceptional shape. Expect vibration from cheap auto part store mounts. It's OEM Honda mounts or vibration. Depending on the brand a little more or less. I suspect it is there and I managed to overlook it repeatedly. I was too tired to go look yesterday after doing the struts in my recently purchased VX. I wanted to go down and look at 5-25 in my binder before replying but I suspect I missed it time and time again. It's nice to see the 40 ft-lb torque values, those were the ones I couldn't believe were not documented. Thank you for pointing this out for me and everyone else. 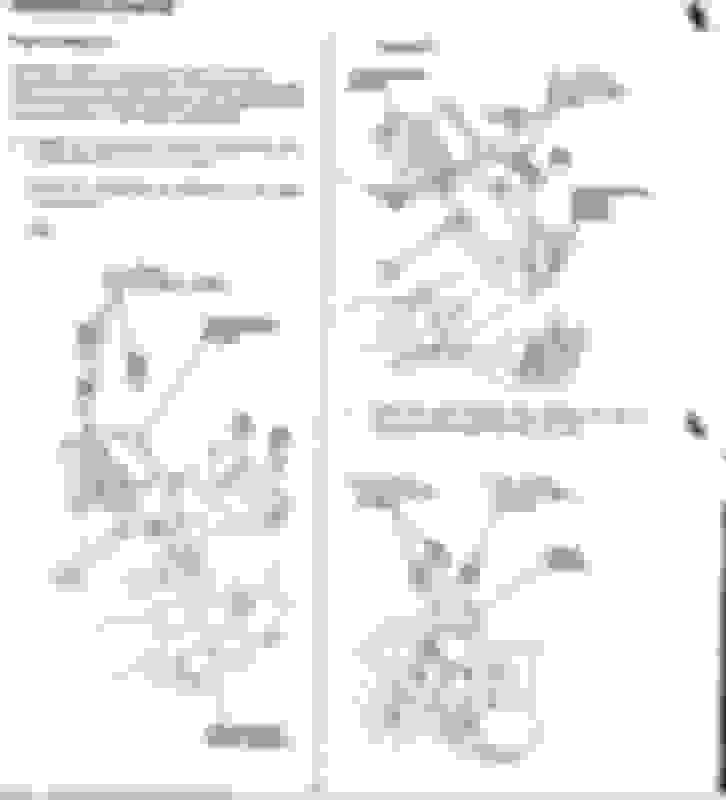 I'll confirm the 92 manual found on-line has 5-25 as you have it shown below. Can someone tell me what to do if changing only one mount? 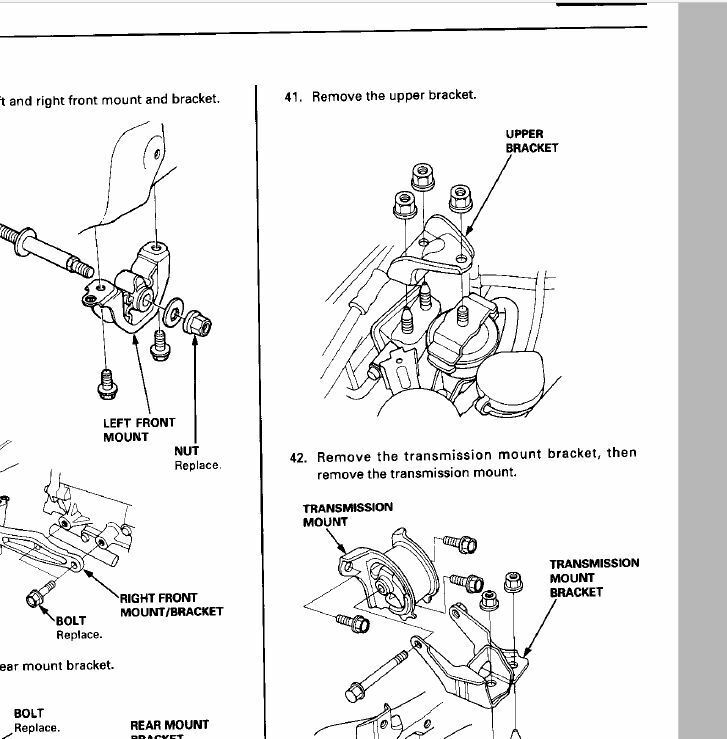 Loosen all mounts, and tighten them by service manual, or something else?